This brochure was prepared in the U.S. Army Center of Military History by George L. MacGarrigle. I hope this absorbing account of that period will enhance your appreciation of American achievements during World War II. After securing strategically located bases during its war with China, Japan set out to create its long-coveted greater east Asia co-prosperity empire. Opening with a crushing attack upon Pearl Harbor on 7 December 1941 that temporarily neutralized the U.S. Pacific Fleet, the imperial High Command quickly followed by dispatching large forces to seize the Philippines, Malaya, and the Netherlands East Indies and preparing plans for new bases from which to strike Australia and India. By June 1942 Japanese authority on the Asian mainland had extended beyond Malaya into Thailand and Burma. 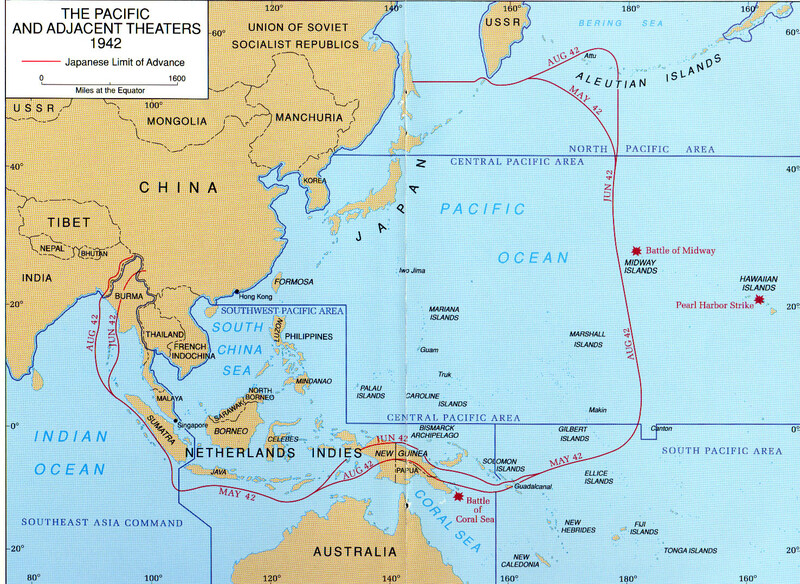 In the western Pacific, it encompassed most of the larger islands north of Australia and east of Midway. In the wake of such astounding military success, Japan decided to push onward rather than consolidate its gains. Its next objectives, New Guinea and the Solomon Islands, were clearly to be used as steppingstones to Australia. Between those objectives and the Australian continent was the Coral Sea, where in early May the American Navy had checked a powerful Japanese fleet in a battle that frustrated the enemy's hope for an early invasion of Australia. Remaining on the defensive throughout the Pacific, the United States hurriedly fortified island bases along a great arc extending from Pearl Harbor to Sydney to keep open the shipping routes to Australia. With only limited numbers of troops available, it nevertheless joined Australia in planning an offensive in New Guinea and the Solomons to halt Japanese advances. To command this offensive in what became known as the Southwest Pacific Area, President Franklin D. Roosevelt selected General Douglas MacArthur, leaving the remainder of the Pacific theater under the direction of the Commander in Chief, U.S. Pacific Fleet, Admiral Chester W. Nimitz. Nimitz's command was divided into three combat areas (north, central, and south). The North Pacific Area extended west from the continental United States, Canada, and the Territory of Alaska across the Pacific to the Asian mainland. Included within Nimitz's North Pacific Area were Japan's northern islands, the Kuriles, and, just 650 miles to the east, Alaska's Aleutian chain. provided a natural avenue of approach between the two countries. Forbidding weather and desolate terrain, however, made this approach militarily undesirable. While spared the arctic climate of the Alaskan mainland to the north, the Aleutians are constantly swept by cold winds and often engulfed in dense fog. The weather becomes progressively worse in the western part of the chain, but all the islands are marked by craggy mountains and scant vegetation. Despite such inhospitable conditions, neither the United States nor Japan could afford to assume that the other would reject the Aleutians as an impractical invasion route. Japanese concern for the defense of the northern Pacific increased when sixteen U.S. B-25 bombers, led by Lt. Col. James H. Doolittle, took off from the carrier Hornet and bombed Tokyo on 18 April 1942. Unsure of where the American raid originated, but suspicious that it could have been from a secret base in the western Aleutians, the Imperial High Command began to take an active interest in capturing the island chain. The Aleutians first appeared as a Japanese objective in a plan prepared under the direction of one of Japan's most able commanders, Admiral Isoroku Yamamoto. With help from the Japanese Army, Yamamoto intended to "invade and occupy strategic points in the Western Aleutians" as well as Midway Island on the western tip of the Hawaiian chain. He envisioned these two sites as anchors for a defensive perimeter in the north and central Pacific. His plan also included the final destruction of the U.S. Pacific Fleet. By using the Aleutians and then Midway as bait, he intended to lure the already weakened American fleet from Pearl Harbor and annihilate it before new construction could replace the losses it had sustained on 7 December. An attack on the Aleutians in early June 1942, Yamamoto believed, would draw the U.S. fleet north to challenge his forces. With the departure of the U.S. warships from Pearl Harbor, he would then move his main fleet to seize Midway. Because of Midway's importance-the island was within bomber range of Pearl Harbor-he concluded that Nimitz would redirect his fleet from the Aleutians to Midway to prevent the loss of the island. Waiting off Midway to intercept that force would be the largest concentration of naval power ever assembled by Japan. After overwhelming the American fleet, Yamamoto would have undisputed control of the central and western Pacific. carriers, left the Kurile Islands to attack the Aleutians, while the remainder of his fleet, which included 4 large aircraft carriers, 9 battleships, and 12 transports, converged on Midway. The Aleutian attack was a sideshow, yet it would reduce Yamamoto's overall available strength in carrier aircraft during the fight for Midway on 4-5 June, one of the decisive battles of all time and the turning point of the Pacific war. Before Japan entered World War II, its navy had gathered extensive information about the Aleutians, but it had no up-to-date information regarding military developments on the islands. It assumed that the United States had made a major effort to increase defenses in the area and expected to find several U.S. warships operating in Aleutian waters, including 1 or 2 small aircraft carriers as well as several cruisers and destroyers. Given these assumptions, Yamamoto provided the Northern Area Fleet, commanded by Vice Adm. Boshiro Hosogaya, with a force of 2 small aircraft carriers, 5 cruisers, 12 destroyers, 6 submarines, and 4 troop transports, along with supporting auxiliary ships. With that force, Hosogaya was first to launch an air attack against Dutch Harbor, then follow with an amphibious attack upon the island of Adak, 480 miles to the west. After destroying the American base on Adak (in fact, there was none), his troops were to return to their ships and become a reserve for two additional landings: the first on Kiska, 240 miles west of Adak, the other on the Aleutian's westernmost island, Attu, 180 miles from Kiska. Because U.S. intelligence had broken the Japanese naval code, Admiral Nimitz had learned by 21 May of Yamamoto's plans, including the Aleutian diversion, the strength of both Yamamoto's and Hosogaya's fleets, and that Hosogaya would open the fight on 1 June or shortly thereafter. Nimitz decided to confront both enemy fleets, retaining his three aircraft carriers for the Midway battle while sending a third of his surface fleet (Task Force 8) under Rear Adm. Robert A. Theobald to defend Alaska. Theobald was ordered to hold Dutch Harbor, a small naval facility in the eastern Aleutians, at all costs and to prevent the Japanese from gaining a foothold in Alaska. Theobald's task force of 5 cruisers, 14 destroyers, and 6 submarines quietly left Pearl Harbor on 25 May to take a position in the Alaskan Sea 400 miles off Kodiak Island, there to wait for the arrival of Hosogaya's fleet. In the meantime Theobald established his headquarters on Kodiak and met with Maj. Gen. (later Lt. Gen.) Simon B. Buckner, Jr., the commander of the Army's Alaska Defense Command. Command authority in the North Pacific Area was divided and cumbersome. Upon reaching Alaska, Theobald became commander of all Allied naval and air forces, authority over the ground forces, which remained under Buckner, with whom he was to work in a spirit of "mutual cooperation." While Theobald reported directly to Admiral Nimitz as his agent in the North Pacific Area, Buckner answered to the commander of the San Francisco-based Western Defense Command, Lt. Gen. John L. DeWitt, who was responsible for the defense of Alaska and western Canada. Any differences between Nimitz and DeWitt in the North Pacific Area would be referred to the Joint Chiefs of Staff (JCS) in Washington for resolution. 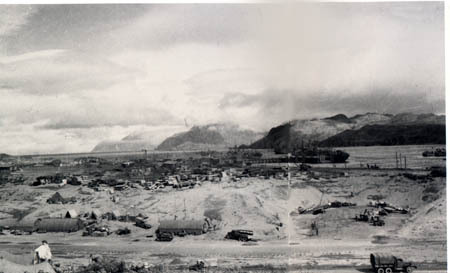 As of 1 June 1942, American military strength in Alaska stood at 45,000 men, with about 13,000 at Cold Bay (Fort Randall) on the tip of the Alaskan Peninsula and at two Aleutian bases: the naval facility at Dutch Harbor on Unalaska Island, 200 miles west of Cold Bay, and a recently built Army air base (Fort Glenn) 70 miles west of the naval station on Umnak Island. Army strength, less air force personnel, at those three bases totaled no more than 2,300, composed mainly of infantry, field and antiaircraft artillery troops, and a large construction engineer contingent, which had been rushed to the construction of bases. On Theobald's arrival at Kodiak, he assumed control of the U.S. Army Air Corps' Eleventh Air Force, commanded by Brig. Gen. (later Maj. Gen.) William C. Butler. This force consisted of 10 heavy and 34 medium bombers and 95 fighters, divided between its main base, Elmendorf Airfield, in Anchorage, and at airfields at Cold Bay and on Umnak. Theobald charged Butler to locate the Japanese fleet reported heading toward Dutch Harbor and attack it with his bombers, concentrating on sinking Hosogaya's 2 aircraft carriers. Once the enemy planes were removed, Task Force 8 would engage the enemy fleet and destroy it. On the afternoon of 2 June a naval patrol plane spotted the approaching enemy fleet, reporting its location as 800 miles southwest of Dutch Harbor. Theobald placed his entire command on full alert. Shortly thereafter bad weather set in, and no further sightings of the fleet were made that day. Early the next morning, despite dense fog and rough seas, Hosogaya launched some of his aircraft to attack Dutch Harbor. Only half reached their objective. The rest either became lost in the fog and darkness and crashed into the sea or returned to their carriers. In all, seventeen planes found the naval base, the first arriving at 0545. As the Japanese pilots looked for targets to engage, they came under intense antiaircraft fire and soon found themselves confronted by U.S.
fighter planes sent from Fort Glenn on Umnak Island. Startled by the American response, they quickly released their bombs, made a cursory strafing run, and left to return to their carriers. As a result of their haste they did little damage to the base. But Hosogaya's fleet remained unlocated, and the U.S. planes based at Cold Harbor had received no word of the attack because of a communications failure. The next day the Japanese returned to Dutch Harbor. This time the enemy pilots were better organized and better prepared. When the attack finally ended that afternoon, the base's oil storage tanks were ablaze, part of the hospital was demolished, and a beached barracks ship was damaged. Although American pilots had finally located the Japanese carriers, attempts to destroy them proved fruitless. As bad weather again set in, all contact with the enemy fleet was lost. In all, the Japanese raid claimed 43 U.S. lives, of which 33 were soldiers. Another 64 Americans were wounded. Eleven U.S. planes were downed, while the Japanese lost ten aircraft. heading south toward Unalaska Island, which he interpreted to be a landing force intent upon seizing Dutch Harbor. In the meantime, he instructed Butler to attack the enemy ships with all available aircraft. Rapidly developing clouds in the area where the enemy ships were reported prevented Butler's pilots from finding the enemy. Six recently assigned B-17 Flying Fortress bombers equipped with radar reported scoring hits upon enemy ships, but these later proved to be uninhabited islands in the Pribilofs chain-north of Dutch Harbor. While Task Force 8 entered the Bering Sea, Hosogaya's fleet moved south to join Yamamoto, who had just suffered the loss of his four large carriers off Midway. Unable to lure U.S. surface ships into range of his battleships, Yamamoto ordered his fleet to return to Japan. Rather than have the Northern Area Fleet join him, Yamamoto now instructed Hosogaya to return to the Aleutians, execute his original mission, and thereby score a success to help compensate for the Midway disaster. Forgoing the planned attack on Adak, Hosogaya moved directly to the western Aleutians, occupying Kiska on 6 June and Attu a day later. He encountered no opposition on either island, but the Japanese public was in fact told that this was a great victory. It learned about the disaster at Midway only after the war was over. At Japanese Imperial Headquarters, the news of Yamamoto's great loss prompted the dispatch of two aircraft carriers from Japan to reinforce Hosogaya. Having correctly anticipated Nimitz's next move-the dispatch, on 8 June, of his two carriers to destroy Hosogaya's fleet- Imperial Headquarters saw an opportunity to immobilize the U.S. Pacific Fleet by eliminating its only carriers. When Nimitz learned of the capture of Kiska, he countermanded his order. Unwilling to risk the loss of his only carriers in the Pacific to land-based planes from Kiska, and presumably informed that Hosogaya would soon have four carriers at his disposal in the North Pacific, he decided to retain his carriers for spearheading a major advance in the Central Pacific. For the Japanese, Kiska without Midway no longer had any value as a base for patrolling the ocean between the Aleutian and Hawaiian chains, but Kiska and Attu did block the Americans from possibly using the Aleutians as a route for launching an offensive on Japan. Originally intending to abandon the islands before winter set in, the Japanese instead decided to stay and build airfields on both islands. Although Generals Buckner and DeWitt would in fact argue for a northern approach to Japan along the Aleutians, the real motive for planning the recapture of the two remote islands was mainly psychological-to remove the only Japanese foothold on American soil in the Western Hemisphere. By mid-June the Joint Chiefs of Staff agreed that the sooner a determined effort was made to oust the Japanese from the Aleutians, the lesser the means required to do it would be. They also theorized that the attack on the Aleutians and the occupation of its westernmost islands might be part of a holding action designed to screen a northward thrust by Japanese forces into Siberia's maritime provinces and the Kamchatka Peninsula. As a result, they informed Theobald and Buckner of their concern about a possible Japanese attack upon the Soviet Union that might also include the occupation of St. Lawrence Island in the Bering Sea and of nearby Nome and its adjacent airfields on the Alaskan mainland. June alone, three separate sightings placed an enemy fleet somewhere between the Pribilof and St. Lawrence Islands, suggesting that either an enemy raid on or an outright invasion of the Alaskan mainland was imminent, with Nome the likely objective. As a result, a sense of urgency bordering on panic set in that triggered what was to become the first mass airlift in American history. Within thirty-six hours, military as well as commandeered civilian aircraft flew nearly 2,300 troops to Nome, along with artillery and antiaircraft guns and several tons of other equipment and supplies. Not until early July- when U.S. intelligence reported with some certainty the departure of Hosogaya's fleet from the Bering Sea-did the threat of invasion of the Alaskan mainland decline, allowing for the redeployment of many of the troops hastily assembled at Nome. In keeping with the Joint Chiefs' desire to move quickly to regain Kiska and Attu, Theobald and Buckner agreed to establish a series of airfields west of Umnak from which bombers could launch strikes against the closest of the enemy-held islands, Kiska. 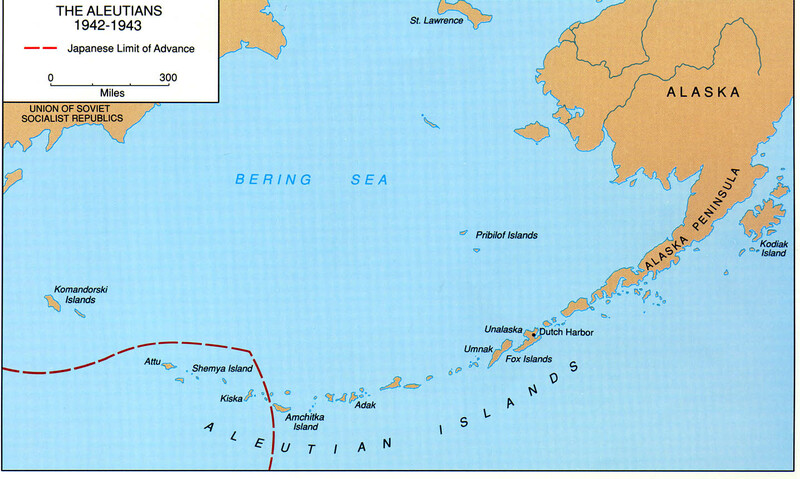 First to be occupied was Adak, 400 miles from Umnak. Landing unopposed on 30 August, an Army force of 4,500 secured the island. Engineers completed an airfield two weeks later, a remarkable feat that they were to duplicate again and again throughout the campaign. On 14 September U.S. B-24 heavy bombers took off from Adak to attack Kiska, 200 miles away. Repeated bombings of Kiska during the summer and into the fall convinced the Japanese that the Americans intended to recapture the island. As a result, by November they had increased their garrisons on Kiska and Attu to 4,000 and 1,000 men respectively. During the winter months the Japanese would count on darkness and the habitually poor weather to protect them from any serious attack. Although continually restrained by the greater importance and more pressing needs of the Solomons and New Guinea Campaigns, the buildup of U.S. Army forces in the Alaska Command continued, reaching 94,000 soldiers by January 1943. By then an additional thirteen bases had been built in Alaska, many of which were in the Aleutians. With an unopposed Army landing on Amchitka Island on 11 January, Alaska Command forces were now within fifty miles of Kiska. Just surviving the weather on Amchitka was a challenge. During the first night ashore, a "willowaw" (a violent squall) smashed many of the landing boats and swept a troop transport aground. On the second day a blizzard racked the island with snow, sleet, and biting wind. Lasting for nearly two weeks, the blizzard finally subsided enough to reveal to a Japanese scout plane from Kiska the American beachhead on Amchitka. Harassed by bombing and strafing attacks from Kiska, engineers continued work on an airfield on Amchitka completing it in mid-February. Japanese attacks on the island then sharply declined. mass in the Bering Sea, the smaller U.S. force compelled Hosogaya to retire without completing his mission and resulted in his removal from command. Henceforth, the garrisons at Attu and Kiska would have to rely upon meager supplies brought in by submarine. Of the two islands, Kiska was the more important militarily. Containing the only operational airfield and having the better harbor, Kiska was scheduled to be recaptured first. For that purpose, Kinkaid asked for a reinforced infantry division (25,000 men). When not enough shipping could be made available to support so large a force, he recommended that Attu be substituted for Kiska as the objective, indicating that Attu was defended by no more than 500 men, as opposed to 9,000 believed to be on Kiska. If the estimate was correct, he indicated, he would require no more than a regiment to do the job. Kinkaid also noted that U.S. forces based on Attu would be astride the Japanese line of communications and thus in a position to cut off Kiska from supply and reinforcement, which in time would cause Kiska to "wither on the vine." After gaining JCS approval on 1 April for the Attu operation (code-named SANDCRAB) and obtaining the needed shipping, work began to recapture the little, fog-shrouded island at the western end of the Aleutian chain. Attu is 35 miles long and 15 miles wide, with snow-capped peaks that reach upward to 3,000 feet. Steep slopes extend down from the peaks to treeless valleys below, carpeted with muskeg, a "black muck" covered with a dense growth of lichens and moss. Because the Japanese current has a moderating effect on temperatures, much of the time in the outermost Aleutians the muskeg is barely firm enough for a man to cross on foot. The same current accounts for the pea-soup fogs, the constant pervading wetness, and the frequent storms that make the outer Aleutians so forbidding. Kinkaid, the commander of Northern Pacific Force, pulled together an imposing armada to support the invasion. In addition to an attack force of 3 battleships, a small aircraft carrier, and 7 destroyers for escorting and providing fire support for the Army landing force, he had 2 covering groups, composed of several cruisers, destroyers, and submarines, for early detection of a possible challenge by the Japanese Northern Area Fleet. Reinforcing the naval support, the Eleventh Air Force was to provide 54 bombers and 128 fighters for the operation, holding back a third of the bomber force for use against ships of the Japanese fleet. had but a single infantry regiment in Alaska, widely dispersed throughout the territory, the War Department provided the needed troops from DeWitt's Western Defense Command, selecting the 7th Infantry Division, then stationed near Fort Ord, California, as the unit to recapture Attu. Trained as a motorized force and at one time scheduled for duty in the deserts of North Africa, the 7th Division was reported to be in a high state of readiness; because of its location near the coast, it could readily undergo the amphibious training required for its new mission. After completing that training during April 1943, the men of the division embarked from San Francisco on transports with their commander, Maj. Gen. Albert E. Brown. over, particularly since the assembled naval support for the landings included three battleships along with several cruisers and destroyers. Three weeks before, a concerted air and naval bombardment of both Attu and Kiska had begun, but it had been largely limited to Kiska because of the continual fog covering Attu. Poor weather caused Kinkaid to postpone the departure of the invasion force from Cold Bay to 4 May, a day behind schedule, and as the convoy neared Attu storms and poor visibility forced yet a further delay until the 11th. The bad weather also seriously reduced the air and naval strikes against Attu. stituted a provisional battalion, were to occupy the head of the valley where a pass gave access to one of the valleys leading back from Holtz Bay. In the meantime, at the end of the western arm of Holtz Bay, the 1st Battalion of the 17th Infantry came ashore at Beach RED. If the 1st Battalion encountered opposition when advancing on its first objective, a camel-back hill mass designated as "Hill X," the provisional battalion was to attack the enemy from the rear. The men of the 1st Battalion, after passing through a rock-studded approach to Beach RED in landing craft, had to scale a steep escarpment that began about 75 yards from the water's edge and rose 200 to 250 feet above the beach. From there they started working their way down the west side of Holtz Bay virtually unopposed until 1800 when heavy enemy fire halted their advance short of Hill X. When the 1st Battalion came ashore Beach RED, the main attack at Massacre Bay finally got under way as the 2d and 3d Battalion Combat Teams of the 17th Regiment landed unopposed on Beaches BLUE and YELLOW, approximately 6 miles south of Chichagof Harbor. Had the landing not been delayed because of dense fog and high seas, a third combat team-the 2d Battalion, 32d Infantry Regiment, attached to the 17th Regiment-would also have come ashore. As it was, that unit remained aboard ship until the next day. The fog, which had hampered the landings, likewise concealed the attackers from the enemy. Not until midafternoon did the Japanese commander, Col. Yasuyo Yamazaki, order his men from their caves to the prepared outer defenses surrounding Chichagof Harbor, a trace that extended from Hill X on the west arm of Holtz Bay, southward to Jarmin Pass, and then eastward to Sarana Bay. SCARLET, 1,100 at Beach RED, and 2,000 at Beaches BLUE and YELLOW. 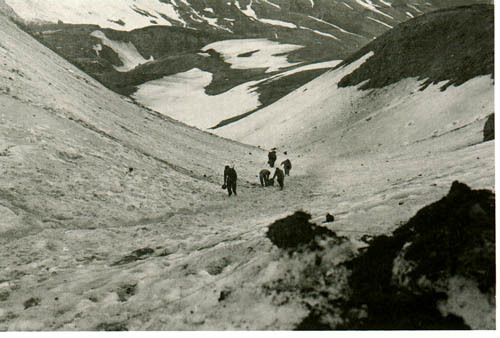 On the northern front, the 1st Battalion was close to Hill X and within twenty-four hours the 32d Regiment, with its 1st and 3d Battalions, was due to arrive from Adak. In the southern sector, the 2d Battalion of the 17th reported that it was within 1,000 yards of Sarana Pass, and the 3d Battalion indicated that it was about 600 yards short of Jarmin Pass. 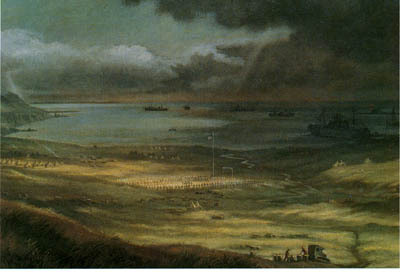 The next day, the 2d Battalion, 32d Regiment, on ship in Massacre Bay, was to come ashore to reinforce the 17th Regiment. If additional forces were needed, General Buckner had agreed to release the 4th Infantry Regiment, an Alaska unit, on Adak Island. Everything considered, it would not have been unreasonable to suppose that within a few days Attu would be taken. The next day, with naval and air support, Brown's men continued their two-pronged attack toward Jarmin Pass. Frontal assaults from Massacre Bay by the 17th Infantry failed to gain ground. As patrols probed to develop enemy positions, the 2d Battalion, 32d Infantry, came ashore at Massacre Bay. In the meantime, in the northern sector, the 1st Battalion, finding the enemy dug in on Hill X, made a double envelopment which succeeded in gaining a foothold on the crest of the hill, but the Japanese held firm on the reverse slope. That night the first casualty report of the operation revealed that forty-four Americans had been killed since the start of the invasion. Further efforts of the Massacre Bay force on the 13th to gain Jarmin Pass again failed, even with the 2d Battalion, 32d Infantry, entering the fight to reinforce the 3d Battalion, 17th Regiment. As U.S. losses continued to mount, front-line positions remained about the same as those gained on D-day. Vicious and costly fighting occurred to the north as the enemy attempted to drive the 1st Battalion troops from Hill X, but the crest remained firmly in American hands at nightfall. The 3d Battalion, 32d Regiment, by then had landed on Beach RED and was moving forward to reinforce the hard-pressed 1st Battalion on Hill X. Naval gunfire and air support of the ground troops continued insofar as weather conditions allowed. to drive the enemy off the reverse slope of Hill X, continue on to seize Moore Ridge, and then take Jarmin Pass from the rear. Each attack quickly bogged down. 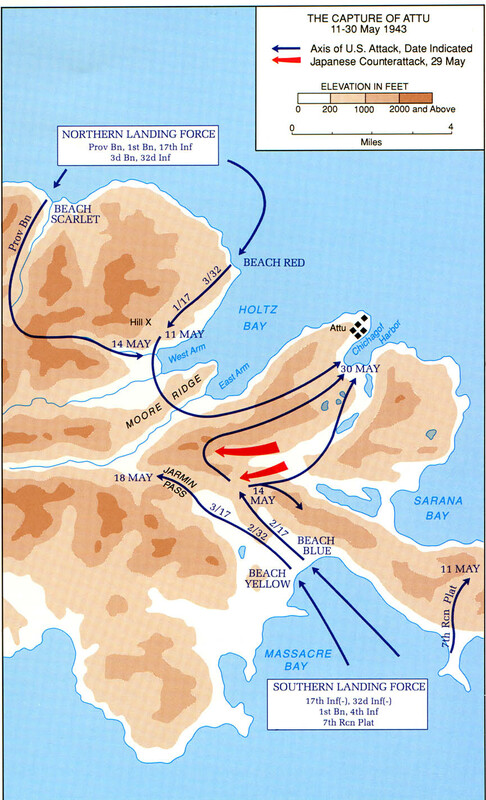 In the northern sector the provisional battalion that had landed on Beach SCARLET remained checked, unable to break out to reach the immobile 1st Battalion, 17th Infantry, and when 3d Battalion, 32d Regiment, failed to reach its assault positions in time, Brown canceled the combined attack. That evening in a report to higher headquarters, he summarized the four days of fighting, concluding that "progress through passes will, unless we are extremely lucky, be slow and costly, and will require troops in excess to those now available to my command." The next morning, the 15th, success remained elusive until 1100 when the fog lifted in the northern sector, revealing that the enemy had withdrawn to Moore Ridge in the center of Holtz Valley, leaving behind food and ammunition. The pullback by the Japanese allowed the provisional battalion to break out and eventually link up with the two battalions near Hill X. As the men of North Landing Force then entered the valley in chase, the relatively clear sky allowed enemy troops on occupying Moore Ridge to place accurate fire upon them. Already slowed by that fire, the pursuit ended when a friendly air strike hit advancing American troops by mistake. Back on Adak, the forward command post for Admiral Kinkaid and General DeWitt, the reported situation at Attu appeared grim. Of special concern to Kinkaid was the exposed position of the ships directly supporting Brown's forces ashore. A Japanese submarine had already attacked (unsuccessfully) one of Kinkaid's three battleships, and reports persisted that a Japanese fleet would soon arrive to challenge the landing. As a result, Brown was told that the Navy would withdraw its support ships on the 16th, or in any event no later than the 17th, leaving him with an unprotected beachhead and a major reduction in supporting fire. Communication problems between Brown and Kinkaid and DeWitt, located more than 400 miles away, coupled with Brown's continued requests of reinforcements-the latest, on the 15th, for part of Buckner's 4th Infantry Regiment-and a long dispatch requesting large quantities of engineer and road-building equipment, and the lack of any positive indications of a speedy breakthrough on Attu persuaded Kinkaid that Brown had bogged down. When he consulted with DeWitt and Buckner, both agreed with him that Brown should be replaced. Upon their recommendation, Kinkaid appointed Maj. Gen. Eugene M. Landrum to take command of Attu on the 16th. An advance by North Landing Force broke the deadlock on Attu the same day Landrum assumed command. By then a foothold on the northern end of Moore Ridge had been won in the center of Holtz Valley, thereby gaining control of the entire ridge. The Japanese, greatly outnumbered by the Americans and in danger of being taken from the rear, withdrew that night (16-17 May) toward Chichagof Harbor for a final stand. Well before dawn, troops controlled by the 32d Regiment in the northern sector moved forward and by daylight discovered that the enemy had gone. Patrols reported that the east arm of Holtz Bay was free of the enemy, allowing for much-needed resupply by sea. In the meantime, the 17th Regiment in the southern sector (at Massacre Valley) also found previously defended enemy positions abandoned, and it occupied Jarmin Pass. mortar nests left manned on the heights by the retreating Japanese, but eventually the combined American force, reinforced with a battalion of the 4th Infantry, drew a net around Chichagof Harbor. The end came on the night of 29 May when most of the surviving Japanese, about 700 to 1,000 strong, charged madly through American lines, screaming, killing, and being killed. The next day the enemy announced the loss of Attu, as American units cleared out surviving enemy pockets. Although mopping-up operations continued for several days, organized resistance ended with the wild charge of 29 May, and Attu was once more in American hands. The Americans reported finding 2,351 enemy dead on the island; an additional few hundred were presumed to have been buried in the hills by the Japanese. Only 28 Japanese surrendered. Out of a U.S. force that totaled more than 15,000 men, 549 had been killed, another 1,148 wounded, and about 2,100 men taken out of action by disease and nonbattle injuries. Trench foot was the most common affliction. Most of the nonbattle casualties were exposure cases, victims of the weather and inadequate clothing. Taking heed of the Attu experience, Kinkaid sought to ensure that the final assault in the Aleutians, against Kiska, would be made with better-equipped and more seasoned soldiers. For the coming invasion his assault troops would wear clothing and footwear better suited for the cold weather; parkas were substituted for field jackets and arctic shoes for leather boots. The landing force would consist of either combat veterans from Attu or troops trained at Adak in the type of fighting that had developed on Attu. its northern end. 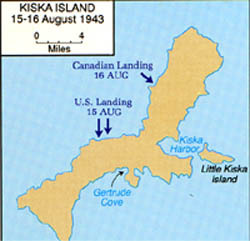 The Japanese had occupied only the central, eastern portion of the island, locating their main base and airfield at Kiska Harbor. They also had small garrisons on Little Kiska Island and south of the main harbor at Gertrude Cove. Unlike Attu, Kiska was subjected to a heavy preinvasion bombardment. Reinforced during June and operating from new airfields (at Attu and nearby Shemya), the Eleventh Air Force dropped a total of 424 tons of bombs on Kiska during July. During the same month, a strong naval task force lobbed 330 tons of shells onto the island. The combined air and surface bombardment continued into August, interrupted only by bad weather. Starting in late July, most pilots reported no signs of enemy activity on the island, although a few noted that they had still received light antiaircraft fire. These reports led intelligence analysts to conclude that the Japanese on Kiska had been evacuated (as was done from Guadalcanal six months before) or had taken to the hills. Convinced that the later contention was more probable, Kinkaid ordered the attack to take place as scheduled, noting that if the Japanese were not there the landings would be a "super dress rehearsal, good for training purposes," and the only foreseeable loss would be a sense of letdown by the highly keyed up troops. Departing Adak, the staging area for the invasion, an amphibious force of nearly a hundred ships moved toward Kiska, reaching the island early on 15 August. Unlike the dense fog experienced at Attu on D-day, the seas were strangely calm and the weather unusually clear. After threatening to land at Gertrude's Cove on Kiska's east side of the island, Corlett's men went ashore on the west side of the island; by 1600 a total of 6,500 troops were ashore. The next day Canadian troops came ashore onto another beach farther north. 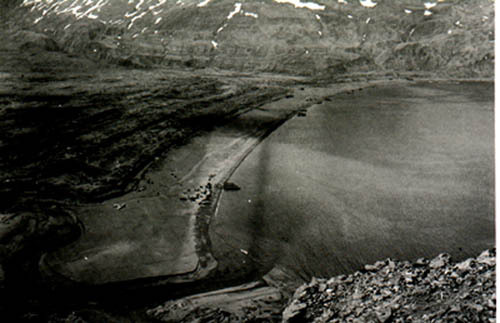 As with the fight for Attu, the landings were unopposed. As Allied troops pushed inland, the weather returned to the more normal dense fog and chilling rain and wind. Veterans of the Attu campaign, in particular, expected that the enemy was waiting on the high ground above them to take them under fire. The only guns that were fired, however, were those of friend against friend by mistake; partly on that account, casualties ashore during the first four days of the operation numbered 21 dead and 121 sick and wounded. The Navy lost 70 dead or missing and 47 wounded when the destroyer Amner Read struck a mine on 18 August. By the time the search of the island, including miles of tunnels, ended, American casualties totaled 313 men. The Allies had attacked an uninhabited island. The entire enemy garrison of 5,183 men had slipped away unseen. To make the embarrassment complete, the Kiska evacuation had been carried out on 28 July, almost three weeks before the Allied landing. The original plan of the Japanese Imperial General Headquarters had been to withdraw the garrison gradually by submarine, but this scheme had been abandoned in late June because most of the submarines assigned to the operation had been lost or damaged. The Japanese also feared that by gradually weakening the garrison over a prolonged period, the operation might fail. It was then decided to evacuate the force at one time, in one movement, using cruisers and destroyers as transports. The date, at first set for early July, was postponed until 28 July. Between then and D-day, Kiska had been under attack and close surveillance by American naval units and the Eleventh Air Force, but the erroneous reports of flak and Japanese activity-which inexperienced observers brought back-had gone unquestioned. Surprise was achieved, but it was not the Japanese who were surprised. On 24 August 1943, Corlett declared the island secure, marking the end of the Aleutian Islands Campaign. By year's end, American and Canadian troop strength in Alaska would drop from a high of about 144,000 to 113,000. By then the North Pacific Area had returned to complete Army control. During 1944 the Canadians would leave and U.S. Army strength in the Alaska Defense Command decrease to 63,000 men. Although interest in the theater waned, it was in the Aleutians that the United States won its first theater-wide victory in World War II, ending Japan's only campaign in the Western Hemisphere. In clearing the Japanese invaders from the Aleutians, the objective had been partly to eliminate a potential military threat but mainly to eradicate a psychological blot. Japan's foothold in the Western Hemisphere was gone. Starting in June 1942 the Japanese had threatened America's northern flank. Fourteen months later the reverse was true, although the idea of using the western Aleutians as steppingstones to Japan had no official approval. General DeWitt and others from time to time urged an assault by this route upon Japan's Kurile Islands, but commitments to other theaters, and the desire of the Soviet Union not to have its neutrality with Japan compromised, thwarted sanction of the proposal. last two years of the war were not involved. But harassing attacks by the U.S. Eleventh Air Force from bases in the Aleutians against the Kurile Islands during that period resulted in Imperial Headquarters' maintaining a large defensive force in the area which, toward the war's end, amounted to about one-sixth of Japan's total air strength. The centerpiece of the campaign was the battle for Attu. In terms of numbers engaged, Attu ranks as one of the most costly assaults-in the Pacific. For every 100 enemy found on the island, about 71 Americans were killed or wounded. The cost of taking Attu was thus second only to Iwo Jima. Of some consolation, the invasion of Rendova in the Solomon Islands during June proceeded well largely because of the struggle for Attu. In an attempt to either reinforce or evacuate Attu, the Japanese Imperial Headquarters had ordered the Fifth Fleet north from Truk in May to the western Aleutians, thereby greatly reducing Japanese naval strength in the Solomons area. While the fleet never reached the Aleutians, its absence from the Solomons allowed the American landings at Rendova to be virtually unopposed. Stung by the brutal fight for Attu, Admiral Kinkaid sought to avert the same mistakes at Kiska. While the full-blown attack three months later upon the deserted island was an embarrassment, the detailed preparation for Kiska was worth the effort. Lessons learned by the Army in preparing and equipping troops to survive the rigors of combat in wretched weather and difficult mountain terrain would prove useful during the upcoming Italian campaign. Many amphibious warfare techniques developed during the Attu landings were refined for Kiska and were further improved and applied to advantage in later amphibious operations in the Pacific. In one sense the departure of the Japanese from Kiska without a fight was unfortunate. It gave American commanders a false picture of what might be expected from the enemy when the odds were hopelessly against him. Instead of fighting to the death, as at Attu, he had faded into the fog without a struggle. But Attu, not Kiska, was to provide the pattern of future battles against the Japanese. For those who wish to study the Aleutian Islands Campaign in more detail, the following official histories provide a carefully documented account of the operation: Stetson Conn, Rose C. Engelman, and Byron Fairchild, Guarding the United States and Its Outposts (1964); Samuel Eliot Morison, Aleutians, Gilberts, and Marshalls, June 1942-April 1944 (1964); and Wesley F. Craven and James L. Cate, eds., The Pacific: Guadalcanal to Saipan, August 1942 to July 1944 (1950), The Army Air Forces in World War II. The best known popular history of the campaign is Brian Garfield's The Thousand-Mile War: World War II in Alaska and the Aleutians (1969). Another book that provides a vivid account of the ground fighting on Attu, one with personal anecdotes from all ranks, is The Capture of Attu as Told by the Men Who Fought There (1944). Cover: The reinforcing 4th Infantry moves inland from Massacre Bay.